Siding with Yelp, a federal appellate court on Tuesday ruled that business owners couldn’t proceed with allegations that the company “extorted” them by manipulating reviews. 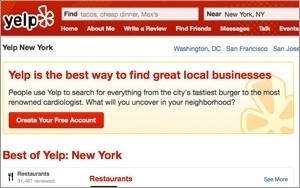 The ruling, issued by a three-judge panel of the 9th Circuit Court of Appeals, puts an end to a 2010 class-action lawsuit alleging that Yelp tinkered with reviews in exchange for ad buys. The company allegedly promised to bury bad reviews — and promote good ones — in exchange for ad buys. The review site also allegedly took down positive write-ups of business owners who refused to purchase ads. The judges then analyzed the situations of the various business owners who sued, concluding that the allegations weren’t sufficient to make out an extortion case. One plaintiff, dentist Tracy Chan, alleged that Yelp removed nine positive 5-star reviews from her page a few days after she refused to purchase advertising. She subsequently agreed to purchase ads, and several of those reviews were reinstated, she said. Chan argued that Yelp extorted her by taking down the positive reviews. Two other businesses — the car repair shop Wheel Techniques, owned by John Mercurio, and veterinary center Cats and Dogs Animal Hospital — alleged that Yelp manipulated their pages by prominently featuring negative critiques. They accused Yelp of offering to downplay those bad critiques — while also promoting good ones — if the businesses bought ads. But the appellate panel said those allegations don’t amount to extortion. U.S. District Court Judge Edward Chen in the Northern District of California previously threw out the case, but for different reasons than the 9th Circuit. Chen ruled that the federal Communications Decency Act immunizes Yelp from liability for reviews authored by users. The 9th Circuit said it wasn’t necessary to decide whether the Communications Decency Act protects Yelp from liability, given the ruling that the business owners didn’t allege facts that amount to extortion.